This week on the Travel Show – we explore "Fort Fright" at Fort Henry National Historic Site in Kingston. Dark Tourism is at its best as Fort Henry – a UNESCO World heritage site, and an icon of Canadian History - is transformed into one of the biggest scare attractions in the Province! Chris will be broadcasting from Kingston and will bring you a spine tingling, behind the scenes preview of Fort Fright! Hollywood-style animatronics, new sound and light technology coupled with live scare actors and creative set designs are guaranteed to give you a sleepless night! Plus - witness the bizarre, the freakish and the absurd with hypnotist Buzz Collins and the new “Spirits and Serpents” experience. Shortly before midnight on September 24th, 1867, an eerie cloud descended over the British garrison at Kingston. Inside, clocks ceased to chime and all things human gave way to occult beings and nightmarish light forms. As if moved by some supernatural force, the huge iron-clad entrance gates closed . . . sealing the fortress like a tomb. Only the haunting screams of the tortured souls forever trapped inside could be heard by those with the courage to approach. For 142 years, no one dared enter . . . until now! Every image you ever had of Fort Henry will dissipate as you timidly walk down the ramp way into the lower Fort over a bridge shrouded in blood-red light, all the while wondering what lies beyond the tall wooden gates. Screams emanate from dark casemates, a ground-level fog hangs at your knees, and the Fort feels colder than ever before. Wait . . . did you just see something . . . or feel something (or someone) brush your shoulder? What's behind that door? You go first . . . no, you! Are those eyes I see? Did that thing just move? Where are you? You instantly become a bath of goose bumps! According to Haunted Walks Inc., who conduct haunted tours of Fort Henry, this site has several resident ghosts including a poltergeist in the bakery, a child who died accidentally at the Fort, a wandering Royal Artillery Gunner who died in an artillery accident in the 1830s and, the most famous character, Nils Von Schultz, a man hung for treason at Fort Henry after leading an 1830s rebellion against Britain. Through strategic and sophisticated special effects, these characters are brought back to life - or should we say . . . death! 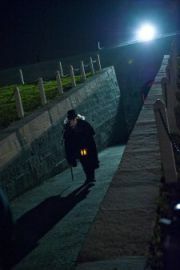 Fort Fright is offered from September 21 through October 29, 2011. The ghoulish gates open Wednesday to Saturday nightly from 6 p.m. to 10 p.m. Guests may purchase tickets in the Little Shop of Horrors and browse through a great selection of terror treasures - or purchase tickets online at www.ticketweb.ca. You can even stay overnight in Fort Henry itself – if you dare!